This month, stargazers have a chance to see the five brightest planets in the sky, weather permitting, as they make appearances in the evening after sunset or as predawn spectacles. And on occasion, the moon will pass by to enhance the celestial view. The May night sky planets are Jupiter, Saturn, Mercury, Venus and Mars, and all are shining bright this month. Here, we present a schedule below which provides some of the best planet viewing times as well directing you as to where to look to see them. May 4 and 5: As darkness falls, look westward to see a fat waxing crescent moon and about 8 degrees to its right is the brilliant planet Jupiter, shining at a magnitude -2. Jupiter and the moon shine together roughly one-third up from the horizon to the point directly overhead and will set at around 12:45 you’re your local time. This is the last month (until September) in which this biggest of planets is high enough in a dark sky to permit crisp telescope views of its cloud patterns and four big satellites. May 10: Saturn reaches opposition; it rises in the east-southeast at dusk, is due south in the middle of the night and sets in the west-southwest at dawn. Once it gains enough altitude, it appears similarly as bright as the zero-magnitude stars Arcturus and Vega. The planet's famous rings appear much more impressive than in recent years, since they are now tipped by 21.5 degrees from edge on. May 11: Looking low toward the south-southeast early this evening, you'll see the waxing gibbous moon keeping company with a bright star and a bright planet. About 6 degrees to the moon's lower left is the bluish first-magnitude star Spica. And about 8 degrees to the moon's upper right is yellow-orange Mars, now coming down in brightness from last month's opposition. Currently at magnitude -0.9, it's nearly half as bright as it was just one month ago; the Red Planet has receded to a distance of 63.8 million miles (102.6 million kilometers) from Earth. May 13 and 14: During the overnight hours watch how the moon's position relative to Saturn changes. At dusk on May 13, look toward the east-southeast. Saturn will appear about 5.5 degrees to the lower left of the moon. The moon will move toward Saturn at its own apparent width (a half-degree) per hour during the night. So by dawn on May 14, the duo will be low in the west-southwest; the moon having moved to within 2.5 degrees to the lower right of the ringed planet. From the southern half of Australia, New Zealand and Victoria Land (Antarctica), the moon will occult (hide) Saturn. Sunday, May 25, sunset. About half an hour after sunset, look for Mercury low in the western sky, framed by Procyon and Jupiter to the left and Capella to the right. 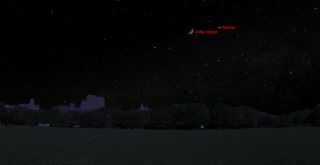 May 25: Venus and a slender crescent moon make for an eye-catching celestial tableau in the night sky before dawn on this morning low in the eastern sky about 45 minutes to an hour before sunrise. Mercury also attains its greatest elongation — or greatest angular distance — east of the sun (23 degrees). This is Mercury's best evening apparition of the year; it sets about 100 minutes after sunset. An hour after sunset, look low above the west-northwest horizon; the speedy planet should be easily visible as a yellowish star shining at magnitude 0.6. Mercury will appear somewhat brighter up to two weeks before this date, and noticeably dimmer for about a week afterwards. May 30: Having faded to magnitude +1.1, Mercury can be found about an hour after sunset roughly 7 degrees to the right and a bit above the 2.5-day-old waxing crescent moon. Editor's note: If you have an amazing picture of Jupiter or any other night sky view that you'd like to share for a possible story or image gallery, send photos, comments and your name and location to managing editor Tariq Malik at spacephotos@space.com.